In southern Alberta when its time for rest and relaxation, people often include the nearest water body in their plans. Swimming, fishing, boating, camping and a host of other activities take place at and on most of the 57 irrigation reservoirs in southern Alberta. 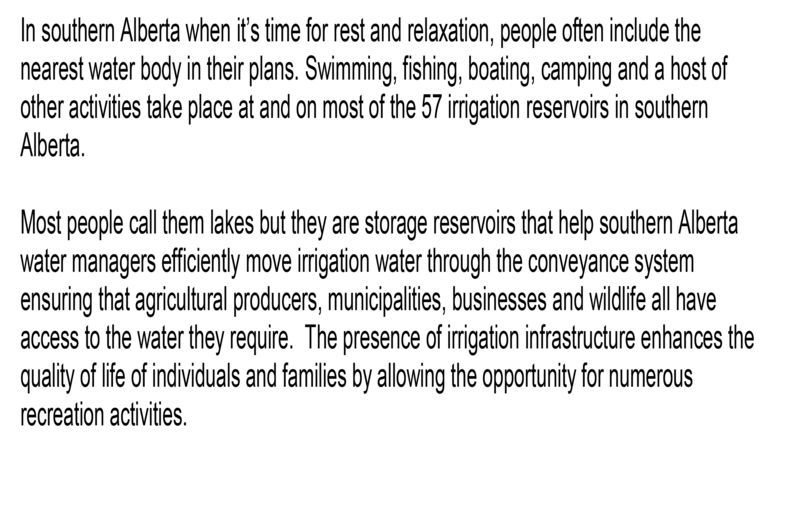 Most people call them lakes but they are storage reservoirs that help southern Alberta water managers efficiently move irrigation water through the conveyance system ensuring that agricultural producers, municipalities, businesses and wildlife all have access to the water they require. The presence of irrigation infrastructure enhances the quality of life of individuals and families by allowing the opportunity for numerous recreation activities.